Take in the beauty of Swiss Alps and beautiful lakes in 8 days as you travel from Switzerland's iconic Zurich. Enjoy the major attractions of the Lucerne region, including a cruise across Lake Lucerne and a journey on the famous cogwheel train on the world's steepest railway. The on to Interlaken, where you have an exciting train experience to Jungfraujoch, often referred to as the 'Top of Europe'. As a tour highlight explore beautiful Brienz and Thun Lakes and their surrounding gems. Welcome to the largest city in Switzerland - Zurich! Upon arrival, your driver meets you at the airport and transfers you to your remarkable hotel for check-in. The rest of the day is free, so you can relax in your room, have dinner at a local restaurant or start exploring the nearby attractions. Following breakfast, you check out from the hotel and leave your bags in the hotel lobby. Here you meet your private guide and enjoy a perfectly-planned sightseeing tour around the most beautiful landmarks of Zurich. Immerse yourself in the unique atmosphere of the Old Town for the following 3 hours, walking through its narrow cozy streets and exploring its breathtaking medieval houses, churches and town hall. After the tour, you take your bags and head to the railway station for a train ride to Lucerne, set amid beautiful snow-capped mountains on Lake Lucerne. Upon arrival, you go to your centrally-located hotel (easily accessible on foot) for check-in. The rest of the day is free, so you can start exploring the nearby attractions of this traditional and picturesque mountain town on your own, dine in a local restaurant or take a rest after your train journey. The tour starts with a cruise across the Lake Lucerne to Alpnachstad. There you board the famous cogwheel train that takes you across the world's steepest railway passing through lush Alpine meadows, spectacular rocks and sparkling mountain streams to the top of Mt Pilatus, the altitude of which is 2132 m (6995 ft). For the return journey, you ride a cable car to enjoy the fantastic scenery once again. As the last part of your magnificent tour, you take a 20-minute bus from Kriens to Lucerne. Tickets* for a public boat cruise, cogwheel train, cable car, and bus are included. After the tour, you return to your Lucerne hotel and have the rest of the day free. Please, note: boat and cogwheel train are available only from middle of May to September. The rest of the year they are replaced with cable car and bus. Following breakfast, you check out from the hotel and go to the station on your own. There you take the Luzern-Interlaken Express. In about two hours you arrive at the Lucern railway station, from where you can easily reach your centrally-located hotel on foot. The rest of the day is free, so you can start exploring the nearby attractions on your own, dine in a local restaurant or take a rest after your train journey. 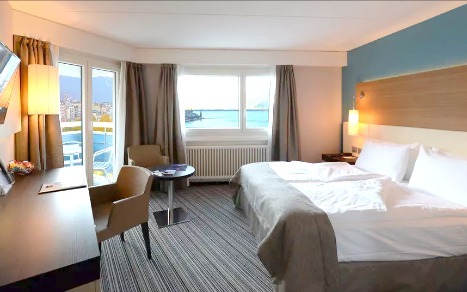 Overnight at your hotel in Interlaken. Today after an early breakfast you walk to the railway station to begin an exciting train journey to Jungfraujoch, the highest railway station in Europe. As you make your way to the 'Top of Europe' you experience riding several trains with panoramic windows to view the most of the incredible Alpine area. Your first destination is Grindelwald, where you change trains and depart to Kleine Scheidegg. This section offers the stunning view of Eigerwand (Eiger Wall), one of the Great north faces of the Alps. The last Kleine Scheidegg - Jungfraujoch cogwheel train partly passes through the tunnel, which was built right across the Eiger rocks at an altitude of 3000 m (9,843 ft). Jungfraujoch is the high-Alpine wonderland of eternal snow and ice*. All this beauty could be marveled at from one of the observation decks located both inside and outside of a 3-story observatory building. Please, note: It is important to wear something warm and wind/rain protective when going to Jungfraujoch. The temperature there is usually lower than in the cities even in summer. In case you feel too cold you can always go inside the restaurants which are close to the observation deck. You can take an interesting walk through the Ice Cave where everything around you is made from ice. The area includes several restaurants, cafés, and shops as well as the place for snow activities to satisfy any taste. For the ride back you travel first to Kleine Scheidegg and then you take a new route: to Interlaken via Lauterbrunnen. This way you see the stunning alpine area from a new perspective. You then return to the hotel and have the rest of the day free. After breakfast, you meet your private guide at the hotel lobby and embark on a fascinating day-tour along the shores of beautiful Brienz and Thun Lakes to discover several of the most remarkable sights of Canton of Bern. Please, note: The boat cruise on Lake Brienz is not available from November to March because the water level is not high enough. The longer cruise on lake Thun during the winter time could be offered instead. At first, you head for the station from where you start your breathtaking cruise on the Lake Brienz. After about an hour of boating on the crystal clear lake you reach your first destination for today - Giessbach Falls. The magical waterfall tumbles 500 m (1,640 ft) in height over several tiers. After enjoying the view of the Falls and nature around, you take a short boat ride and arrive at Iseltwald, a typical Swiss village located at lake Brienz. Iseltwald is nominated to be the most beautiful village in Switzerland. Here you have some time for lunch before the public bus takes you to the Weissenau Ruins located on Thun lake (the duration of the bus ride is about 30 min). Your professional guide tells you the history and legends of this place before you continue your tour through the nature reserve. You then stop and have some rest on the terrace of a restaurant located on the bank of the Thun lakeshore. Here you enjoy the wonderful view of incredible mountains and an exciting lake of light blue color. On your way back you take a public bus, and in about 15 minutes you reach Interlaken and return to the hotel. The rest of the evening is free. Today following breakfast you check out from your hotel and head to the railway station for your train ride back to Zurich. You take the Lucern-Interlaken Express* to admire the beauty of Swiss Alps once again. Please note: alternatively you may take the train to Zurich via Bern and add an additional overnight to tour the capital of Switzerland. Please contact your travel specialist for the details. After train transfer in Interlaken you head for Zurich. Upon arrival, you walk to the hotel, check in and have the rest of the day free. You can take a rest after your train journey or enjoy an optional tour carefully prepared for you. This is the final day of your tour. Following breakfast, you check-out from the hotel and your driver takes you to the airport for the departure.